Sagebrush plains, rimrock vistas, craggy mountains and unspoiled rivers define this landscape, which calls out for backcountry exploring. Find a section of the Oregon Trail, fish for trout in a Wild and Scenic River or stay the night on a working cattle ranch. Learn about the rich native heritage that goes back 10,000 years, give or take. Take in the open skies and breathe the fresh air while encountering some of the kindest folks on the planet. 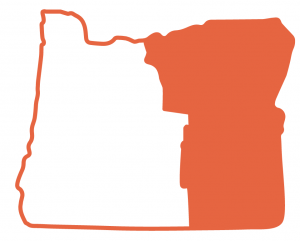 It’s all here in Oregon’s biggest, wide-open region. 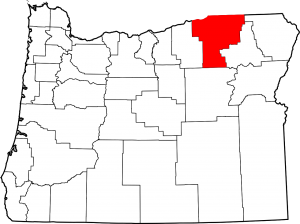 If you’ve already checked out our tri-county NE Oregon trail and are jonesin’ for more, here is some information about our friends in the rest of Eastern Oregon. Pendleton offers several unique stops for visitors seeking inspiration from arts and cultural organizations in the area. Firstly, the Pendleton Center for the Arts anchors the middle of town with a beautiful art center, housed in a historic Carnegie library building built in 1916. The Pendleton Center for the Arts has a large gallery space with exhibitions that rotate monthly; they also offer classes, host music performances, and have a gift shop stocked with many wares by local artists. The Feves Art Gallery at Blue Mountain Community College campus is named in honor of the pioneering ceramic artist Betty Feves who spent much of her life in Pendleton and often dug and processed her own clay from the nearby foothills of Oregon’s Blue Mountains. The Feves Gallery is open during the academic year (September through May, closed during the summer break) and exhibits a variety of rotating exhibitions. About 10 minutes outside of downtown Pendleton you can find the Tamástslikt Cultural Institute dedicated to preserving and sharing the cultural heritage of the Cayuse, Umatilla, and Walla Walla tribes of the Native Americans. Nearby, next to the historic St. Andrew’s Mission, you can find Crow’s Shadow Institute of the Arts, a non-profit art center with a gallery and artist residency program that specializes in contemporary fine printmaking. Crow’s Shadow was founded by the painter James Lavadour and friends in 1992 to support contemporary Native American artists, although today visiting artists come from around the globe to print in the Crow’s Shadow studio. The Crow’s Shadow gallery exhibits prints from previous artists-in-residence and every spring shares an exhibition of works by printmaking students from the local tribal High School, Nixya’awii Community School. The Oregon East Symphony typically hosts 5 concerts per season, including the popular Holiday Music Festival which features a range of musical groups and a big-band swing finale. In the summer there is a free concert series Wednesdays in the Park at Roy Raley park featuring indie bands and a beer and pizza garden hosted by local favorite Great Pacific.